These cafeteria tables are designed for safety and convenience. From setup to cleanup and everything in between, they will help keep things running smoothly in your lunchroom. Heavy-duty casters lift off the floor when the table is in the open position and a torsion bar system allows one-person opening and folding. To prevent tripping, casters do not extend beyond the surface of the table. A low-maintenance laminate surface and phenolic backer make these cafeteria tables durable and easy to clean. When fully opened or closed, an automatic lock engages to ensure stable positioning and prevent accidents. Tamper-free hardware ensures that these lunchroom tables will stay in great shape for many years to come. Color Options: Available in a selection of tabletop colors. Easy Clean: Power-washable phenolic backer on underside of tabletop adds sanitary protection. Convenient Design: Table locks in the partially-folded position for easy cleaning underneath. Lock releases manually from both sides of the table. Sturdy Support: Tamper-free hardware and a 16-gauge steel apron and legs ensure strength. 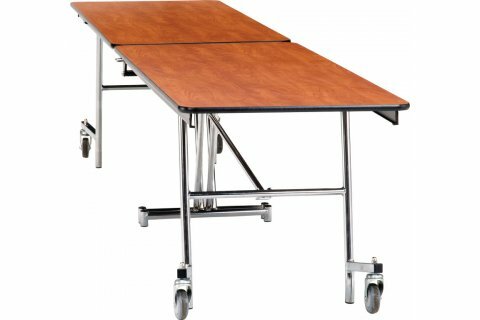 Extra Safe: Lifted casters do not stick out beyond the table surface, preventing tripping. Smooth Rolling: Rolls on heavy-duty, extra-wide 4” non-marring casters. Each caster can support up to 275 pounds. Height Selection: Comes in standard 29" height as well as 25", 27" and 32".